This was my second trip to Dhaka in a decade. The last time I was there was three years ago. Every time I go home, I have a little bit of a shock. Things seemed to have changed in leaps and bounds. By the time I'm ready to leave, I get used to it all. That's the way it should be though, after all Bangladesh is my home. Upon my arrival at Zia International Airport, I was greeted by huge lines. I was especially grateful to have made it this far, only to be stopped in my tracks by the immigration line. As a matter of fact, I had been hanging out by the beach in Thailand, on my way to Dhaka. I was five feet from the ocean on December 26, 2004 and had the unique experience of being chased by a Tsunami. I was literally chased all the way home to Dhaka, only to come to an abrupt halt at immigration. Once I finally made it through immigration and customs (phew! ), I was happy to be united with my family and friends. It was the best reunion I ever had. 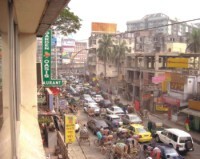 My first impression of Dhaka was that it looked somewhat cleaner than I remembered it. This pleasant thought was quickly interrupted by the onslaught of cars driving on the wrong side of the road. I realised some things hadn't changed. The traffic grid-lock seemed to be at it's worst. On a particularly good day it took me one hour to get to Dhanmondi from Eskaton. I estimated the distance to be about 4 km. I could walk that distance in about half the time. But how would I walk in the middle of the day? I'd be lost in the same grid of traffic, dodging cars, carts and rickshaws, without the armour of my vehicle to protect me. And getting to Gulshan from Motijheel? I might as well write my day off. The cleaner air, I later found out, was because of the vast number of vehicles now using natural gas. That also explained why all the colourful scooters had vanished and in their place there were green look-a-likes with the letters CNG on them. I have to laud the country for taking such steps. I was further impressed that a good deal of people now ran their cars on natural gas because it was cheaper. Taka 35 a litre seemed a bit high for petrol and I'm sure natural gas is a more attractive alternative. However, high petrol prices obviously weren't stopping the influx of petrol-guzzling luxury cars. I spotted a couple of Hummers and BMW 7-series vehicles. I was, however, impressed to see that the world's safest car Volvo had made it's way to Bangladesh. Thankfully, Volvo's high-tech safety features would not be put to test, because where in Dhaka can one drive above 20 km per hour? The number of apartment buildings under construction and the number of people selling their plots to construction companies blew my mind! Since my days as a lecturer at North South University back in 1995 things have certainly changed. Back then, NSU and IUB were among the few prominent private universities. Today Dhaka city boasts an impressive number of private universities. And what's the buzz word these days? "MBA" of course. Everyone wants to do an MBA. It's great to see people aspiring to do things other than engineering and medicine. Entrepreneurship seems on the rise too. Everyone has a mobile phone. And mobile phones come with their own culture and lingo. One day I heard my mom say missed call marse amake! (Someone gave me a missed call). I then learned of the art of having someone else pay for a conversation that you essentially initiated. It was hilarious! Even our Imams have become high-tech savvy. In the days of yore, the imam would ask to straighten the rows before salat. Now he makes an additional announcement to switch off mobile phones. Traffic grid-lock in Baily Road. 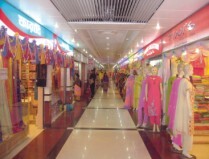 Colorful sari shops in Bashundhara City. Bashundhara City shopping complex was another eye-catcher. I was impressed by the stylish glass capsule elevators and the food court on the 8th floor. You could find burger, pizza, biryani, tikkas, phuchkas, anything your palate desired. 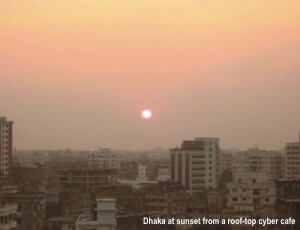 The stained glass ceiling and the views of Dhaka city from the cyber café balcony also scored points. And ofcourse, you can shop till you drop there--leather goods, clothings, DVDs, saris, and anything else your heart desires all under one roof. But I noticed that on certain days it was hard to get a salesperson to help. The Tigers were the talk of the town. They made Zimbabwe bow and that was no small feat. It really made me proud to see Bangladeshi cricketers make history. My six year-old and eleven-year old nieces were also visiting and I wanted to take them somewhere special. The Liberation War Museum would be the perfect treat. What amazed me was how accessible the museum is costing a mere Taka 3 to enter. And what amazed me even more was how few people I asked had set foot in it. My nieces devoured the tour guide's elaborate description of our fight for sovereignty. The best part about being home is always being with family. The day I arrived I had a wedding reception to attend. Everyone in Dhaka complains about the number of weddings they have to go to. Not me. For me weddings in Dhaka are always fun and I miss them when I'm in the States. They are also a chance to meet with family and friends, all in one place. And what could be better than a celebration of life, after a near-death experience such as a Tsunami? In fact, having survived, I realise now that life is unpredictable and one should really focus on what's important. What's important to me is to remember where my home is. It's where I belong: Bangladesh. Nabeel Atique is an Ajunct Mathematics Instructor at San Jose and Evergreen Colleges in the San Francisco Bay Area as well as an avid mountaneer.